A great new accessory arrived last week, the new Aero Precision COP (Continuous Optics Platform). 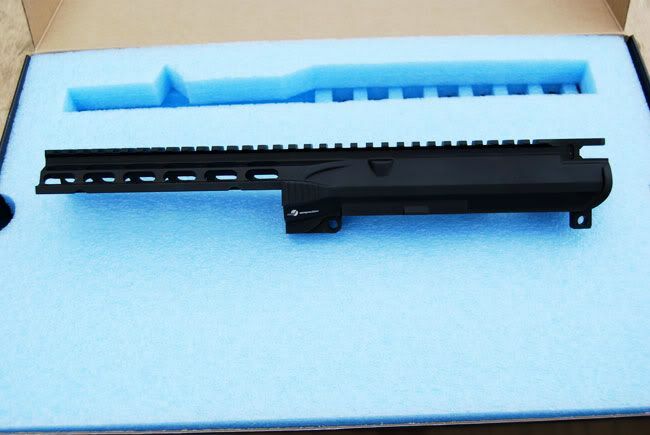 Proudly made in the U.S.A., this is a one-piece complete upper/handguard replacement for the AR15 rifle that makes mounting optics and accessories a breeze. There is no more bridging the gap between handguard and flattop upper receiver when mounting longer eye relief scopes. The upper is rigidly structured for greater accuracy. BUT, what truly makes this a different concept is the ability to change the left, right and bottom rail panels to make your upper WHAT YOU WANT. 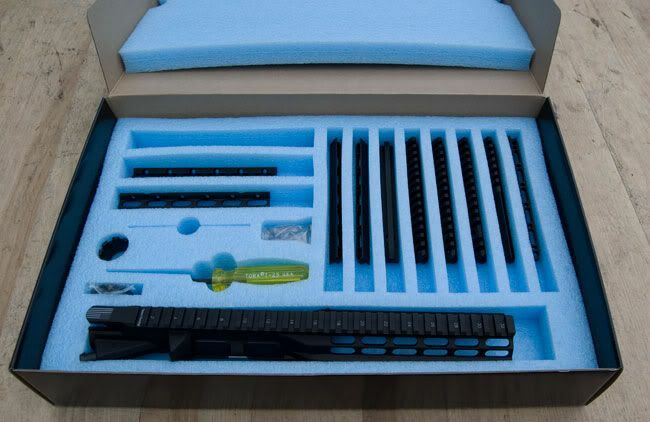 You could install the 3 included picatinny rail sections to make a railed unit, or insert the 3 flat sections to give the upper a more rounded feel, or use the two half railed sections like I did to provide a smooth rear section but the ability to mount accessories towards the front. 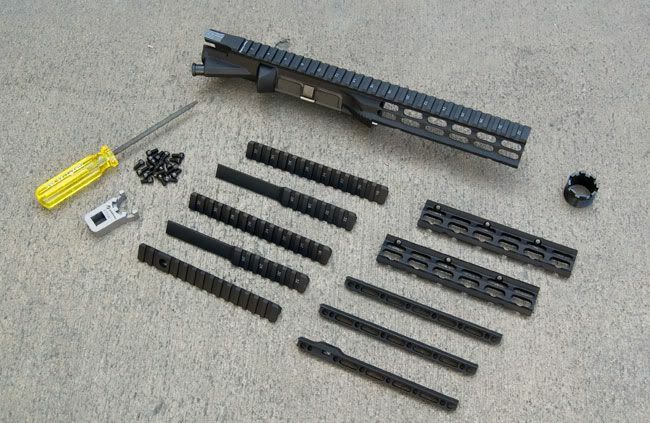 The combinations are endless as you can even flip the half-railed sections so that the rail slots are in either the front or the back of the handguard. And Aero Precision didn’t go cheap and leave you to find your own tools, included is a Torx screw driver and a proprietary barrel nut and proprietary barrel wrench. 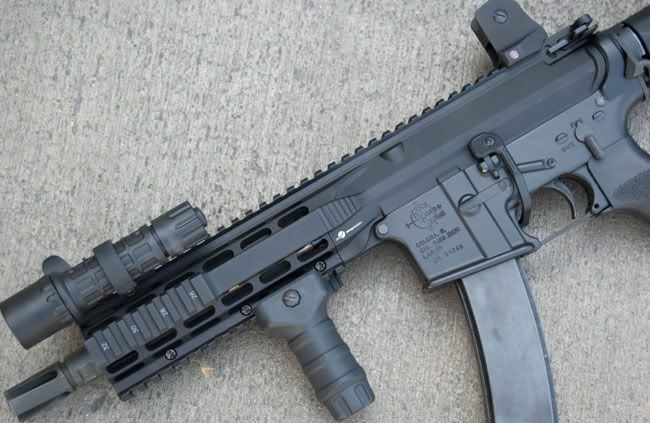 Currently, only the carbine length rail is available but future offerings will include a mid-length and rifle-length COP upper. It’s been awhile since we have had such a selection of Surplus .308 ammunition. In fact, this might be the nicest variety of Surplus .308 (7.62×51) in 10 years. Beautiful early 1980’s surplus FN Belgian .308 NATO (7.62×51) ammunition. Features a 144grn lead core full copper jacketed bullet, brass case, and non-corrosive berdan primer. Packaged 50rds to a box, and 1,200rds (24 boxes) to a resealable metal can. ORM-D weight restrictions will allow for only 20 boxes (1,000rds) and the can to be shipped in a single package. 1990’s Surplus German NATO 7.62×51 (.308) DAG ammunition. This is beautiful, accurate ammunition packaged for long term storage. Features a 147grn lead core full copper and nickel (magnetic) jacketed bullet, brass case, and non-corrosive berdan primer. Packed 20rds in a box, 200rds (10 boxes) in a sealed waterproof PVC battlepack. 1990’s Production British Surplus Radway Green NATO spec. .308 (7.62×51) ammunition. Features a NATO headstamp, 147grn full copper jacketed lead core (non-magnetic) bullet, brass case, and non-corrosive Berdan primer. Incredible packaging! Packed 5rds to a charger (stripper clip), 75rds (15-5rd chargers) to a military grade nylon bandolier with metal snaps, and 750rds (10 bandoliers) to a sealed battlepack inside a wooden crate. South African Surplus .308 (7.62×51) ammunition. Manufactured in the late 1970’s to early 1980’s. 147grn Lead core, Copper Jacketed, Non-Magnetic, FMJ Bullet. Brass Case, Non-Corrosive, Berdan Primer. Packaged 7 boxes(140rds) to a Sealed Waterproof Battlepack, 980rds (7 Battlepacks) to a 980rd resealable ammo can. In 1891, the Russian Empire adopted a bolt-action rifle chambered in 7.62x54R, and designated it Model 1891. In 1930, the sights, barrel bands, and receivers were altered and the rifle was given a new designation: the 1891/30, or 91/30 for short. Aside from altering the rifles that were being newly produced, the government also began updating rifles already in existence. Rifles were made in Russia, Finland, France, and even by Remington at one point! The 91/30 was the workhorse of the Russian armed forces for decades and saw action in both World Wars and was witness to the fall of the Russian Empire and its transition to the Soviet Union. Because these weapons were so widely produced for more than half a century, the 91/30 provides a unique opportunity to own a piece of history and a real powerhouse for relatively little money (try finding a usable US M1 Garand for <$80!). The size of the 54R cartridge falls squarely between the .30-06 (7.62x63mm) and the .308 Winchester (7.62x51mm) so you know you’re shooting a rifle! Some people even load their 91/30 up with soft point ammo for deer season. With the bayonet, sling, and ammo pouch (for starters), you can really get an authentic feel for what it must have been like for a Russian soldier more than sixty-five years ago. Whether it’s a round receiver or a hex, made by Izhevsk or Tula, there are so many little variations that you’re almost guaranteed to get a different rifle each time. We took the Polish P-83 “Wanad” Pistol to the Range today. What a pleasant surprise shooting this pistol is. It lacks the typical bite that most 9×18 Makarov pistols of similar size have, and is really a zippy little shooter. Accurate as well. The P-83 “Wanad” replaced the P-64 as the official Polish Military and Police sidearm in the early 1980’s. I believe the “Wanad” refers to the metal or metal process used in the construction of this Pistol. It’s a heavy little sucker at 1.6lbs unloaded. I am sure that helps with the little felt recoil. Introducing the new Daniel Defense M4 V3 Mid-length 5.56/.223 Rifle. This is our first video production, so be nice. The Golden Age of 5.45×39??? It was brought to my attention today that in March we sold 300% more 5.45×39 surplus ammunition than we did 7.62×39! 5.45×39 is the current military caliber for the Russian military and many former Warsaw Pact countries. We are seeing an influx of this ammo into the US commercial market as it’s now 20 years old and being surplussed by countries that will either be replacing it with newer stock or changing over to a new caliber. 7.62×39 caliber rifles outnumber 5.45×39 caliber rifles at least 40:1. So what has pushed the 5.45 round to be the current hot seller? 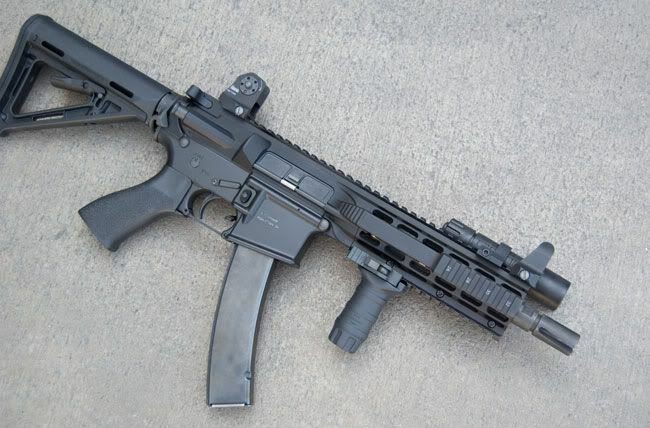 Well S&W coming out with a 5.45 upper and complete rifle certainly hasn’t hurt 5.45×39 ammunition sales. Neither has the influx of AK74 type rifles being built with US receivers and imported rifle kits. BUT the true key is so many guys are looking back at the ammo market ten years ago when prices were 30% of current prices in other calibers and decided that now is the right time to stock up on the cheap. Comparatively, 5.45×39 ammunition has never been cheaper than it is right now. Our average sale is 4 cans (4,000+ rounds! ), $480 plus shipping. How much .223/5.56 could you get for that much? Barely 2,000rds. I have had a lot of customers tell me that they are buying the ammo now without even owning a gun in the caliber and will pick up an AK74-type rifle at a later date! In a few years I guess we will know if this was truly the golden age of 5.45×39! Ever wondered how we can sell AR15 Magazines so cheap..? So how can we sell magazines so cheap!? They must be crap quality and will fall apart the first time you use them right? Or they are made overseas by some poor kid working 120 hours a week for $1.16 a day.